The figures within Cate White’s paintings are heavy, burdened with the inescapable weight of culturally constructed meaning, history and ideology pinned to each bodily representation and similarly carried by each viewer who approaches the artist’s work. Yet at times the figures within the canvasses are afforded a luxury that most corporeal viewers aren’t–they begin to dissolve, existing as just an outline, or a fragment of a leg, subsumed by the environment of the painting around it, shedding their cultural body and transitioning into an unbound state, where they are in the world but not of it. It’s this very unexpected tension that permeates White’s latest body of work–the weight of the cultural body beset against the expansive foreboding void that threatens the annihilation of the worldly self and a synthesis into the larger cosmic order. “My Best Unbeaten Sister” is a play on the lyrics of a Bonnie “Prince” Billy song “I See A Darkness”, acting both as references to the starry space that populates so much of the artist’s recent works, as well as the fact that so many of Cate’s recent paintings seem to be dominated by women. What began as a series of paintings depicting archetypes of masculinity, soon was taken over by women–from Goldilocks to a group of young friends standing ominously over a cake yet to be cut, to a young mother pushing a baby carriage while being leered at from a passing car. 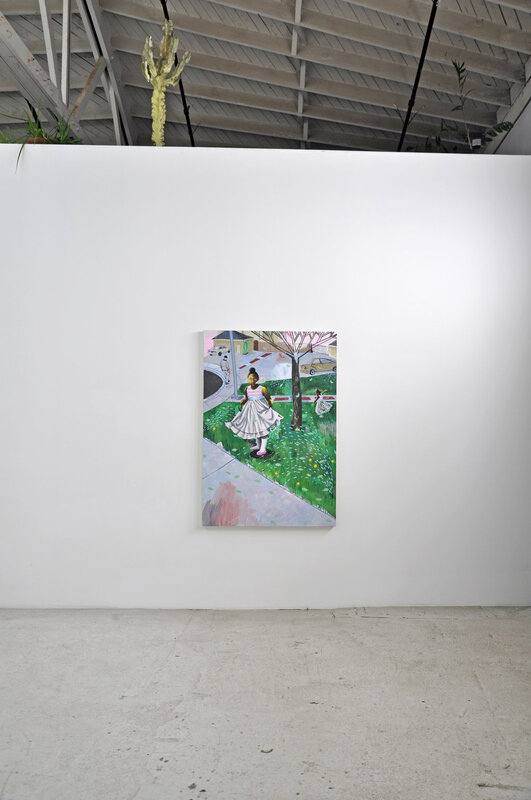 Not unlike so many of the vital movements and cultural conversations of late, My Best Unbeaten Sister pays tribute to the sense that women have taken power in new ways throughout the exhibition’s many paintings and sculptural forays. Yet to simply distill the many boundaries and barriers between social strata that the artist’s paintings seek to dismantle to the field of gender, would be to sell short the artist’s latest body of work. For some time Cate has expressly painted only people she knows in an effort to maintain a kind of veracity between the artist’s lived world and that within the paintings, yet the works within My Best Unbeaten Sister take their subjects and situations more from the symbolic realm, inflected with a heavy sprinkling of art historical references. The largest and perhaps most weighted work within the exhibition features a mother pushing a baby carriage through a largely barren urban landscape. Trailing the mother is a leering skull-like face protruding from a large SUV. Yet despite the horrifying figure trailing there’s an overriding sense of serenity carried in the mother’s face and disposition–even extending to an aura of protective space that extends around the figure threatening to obscure much of the surrounding madness. If the structure of the painting feels oddly familiar–a determined figure in profile flanked by larger figures that border the edges of the canvas – it’s due to the fact that the painting references Norman Rockwell’s 1963 painting “The Problem We all Live With”. Rockwell’s iconic image famously depicted the scene of 6-year old Ruby Bridges entering a previously all-white New Orleans elementary school, flanked by suited US Marshalls, racial epithets plastering the background wall. The painting for Rockwell represented a break within the artist’s career, moving from painting largely quotidian family scenes to a wrenching image ripe with agency. 56 years later, the racial dynamics implicit within Rockwell’s paintings are very much alive within Cate’s, as the leering man in the car is white and the walking mother and child are black. The scene was one that the artist had observed in West Oakland, and felt compelled to depict and structure the work within that of the historical painting, yet much of the work departs quite liberally from the Rockwell–most notably with the mother’s baby, comprised from an ethereal misting of gold spray paint with a meandering outline, stretched from the pushed stroller returning the middle finger to the scowling driver. Rockwell’s famous work stood out to the artist in how it combined so many issues at the forefront of the artist’s mind, from it’s conflation of the white and male gaze (both tools of power if we subscribe to their authority to define us), to the ways in which visibility for othered bodies doesn’t always equal being seen, because of how the symbol of the cultural body so often obscures our humanity. Just as the mother within Cate’s largest work walks absolutely undeterred, the artist’s recent paintings and thoughts center around the contact with one’s sense of self outside of culture, as a means of walking through culture untouched at the soul by false perceptions. In the same way that so many of the figures within Cate’s work teeter on the brink of the impending abyss of that starry space, the artist and her most recent works finds a real comfort in jumping into that same unknown. 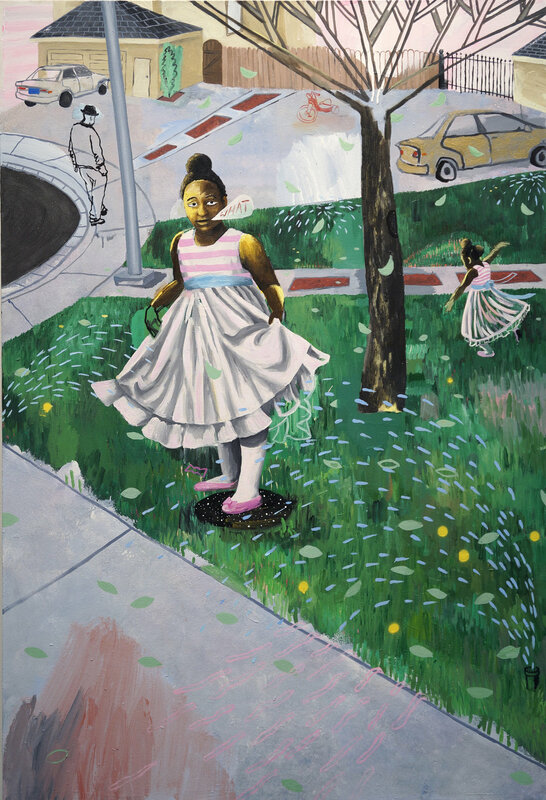 The promise of that expansive abyss, of the space in which we shed the weight of the ego and cultural body and are able to explore unknown territory, addressing and healing our suppressed wounds is not unlike the difficult conversations regarding race, representation and power that Cate’s works continue to evoke. To honestly address and converse interpersonally and as a society on race, gender, class and any other social strata in which power plays, is so much like the process of delving into that unknown abyss, with the hopes of emerging more free having shed some of the weight of our cultural bodies. This project was created while in residence at Mills College as part of Artist + Process + Ideas (A+P+I).